In a moment reminiscent of the unfortunate Phil Hughes incident, Sri Lanka opener Dimuth Karunaratne was hit on the back of the neck off a vicious bouncer from Australia fast bowler Pat Cummins on Day 2 of the Canberra Test. After copping the blow, Karunaratne quickly dropped his bat and fell on to the ground. Luckily, though, he hadn’t lost consciousness, which is evident from the fact that he was responding to a couple of medics out there. Subsequently, the 30-year-old was stretchered off in a golf buggy before being taken to a nearby hospital. 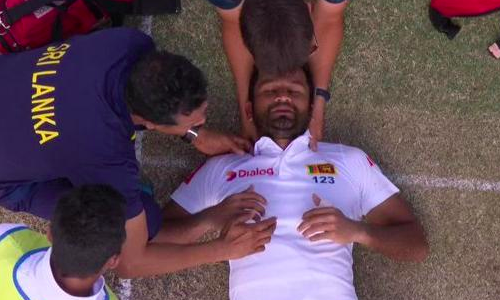 “Dimuth complained of pain in neck and tingling to his hands following being struck in the back of the neck, decision then made to transport him to hospital where he is currently being assessed. Updates will be provided when more is known,” Cricket Australia said in a statement. Sri Lanka, who were 81-0 until Karunaratne’s departure, lost three quick wickets to be 123-3 at the end of Saturday’s play. Earlier in the day, Australia declared their innings at 534-5. The hosts lead the two-Test series 1-0.